Comvita Propolis Extracts are made from the highest quality New Zealand Propolis. The Propolis Flavonoid Level (PFL) measures the amount of health-promoting active ingredients in the propolis product. New Zealand`s most popular propolis product, now also available in a double-PFL formulation, is made from highest quality propolis in an alcohol-free base. 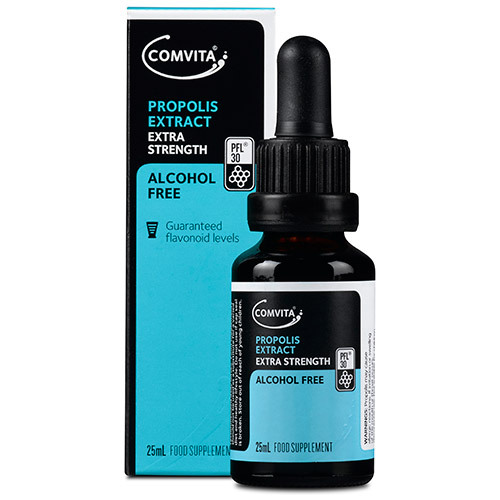 Comvita Propolis Extract contains extracted Propolis solids dissolved in a glycol base, suitable for those wanting to gain the benefits if liquid Propolis ingestion without having to take any alcohol. Comvita Propolis Extract can be taken internally for immune support, as an antioxidant, and as a liver tonic. Propolis in this form can also be used to assist the body`s response to mouth and stomach problems. Bottles come with dropper tops for easy dosage and application. Propylene glycol, Propolis extract (214mg pure Proplois, equivalent to 611mg fresh Propolis). Take 3 - 6 drops three times daily. Apply directly to the throat or mix in water to drink or gargle. Warning:Propolis may cause severe allergic reactions in allergy sufferers. If swelling of the mouth or throat occurs, discontinue use. Below are reviews of Comvita Propolis Extract PFL30 Alcohol Free - 25ml by bodykind customers. If you have tried this product we'd love to hear what you think so please leave a review. Comvita Propolis Extract can be taken internally for immune support, as an antioxidant and as a liver tonic. Propolis in this form can also be used to help support and maintain oral and digestive health.